Oregon Beachcomber Blog - What's washing up? : How far out at sea should you be to survive a tsunami? How far out at sea should you be to survive a tsunami? Can you 'ride out' a tsunami? We've all heard the stories: a fisherman rides out a tsunami far out at sea, then returns to land to find his home port devastated without his knowledge. But is this possible? The answer is actually quite surprising... and possibly life-saving. Tsunami waves are really unique things. The scale of them far exceeds normal wind waves, and the physics of them is completely different than those very long-wavelength tidal waves that drive the rise and fall of tides around the world. 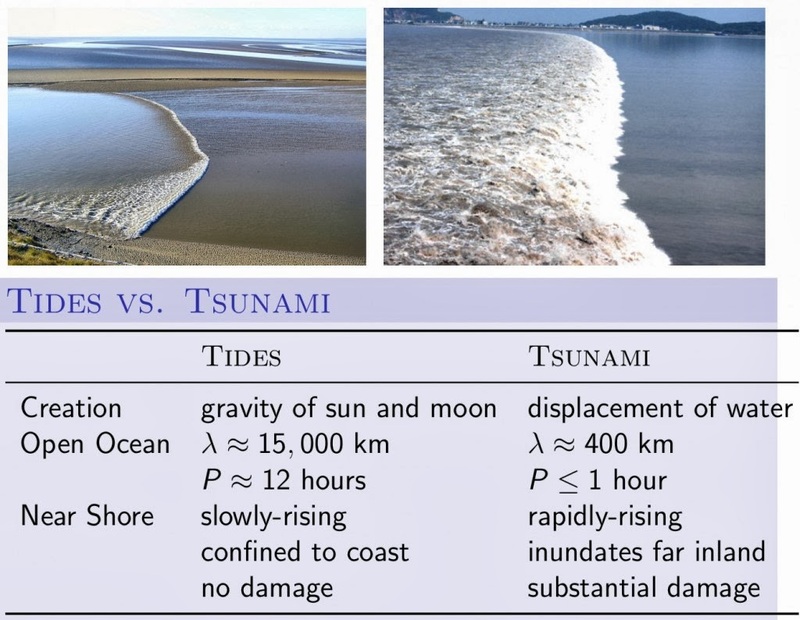 Tidal waves and tsunamis are completely different things, even though the terms are sometimes confused! Looking at the image above, you can see that in the open ocean, the wavelength of a tidal wave (That is, the distance from peak to peak) is extremely long: 15,000 km or ~9,320 miles. Also, the period of these waves is 12 hours (or 6 hours between peaks for some areas); meaning that it takes 12 hours for that high or low tide to reach shore. Tsunamis are completely different waves. Instead of a steady displacement of water, by the time tsunamis reach shore they are a churning mass of water (think of a giant breaker on the beach) that move with a wavelength of 400 km or 248 miles, meaning they can reach speeds of 248 miles per hr; this is why they often reach shore with little warning after an earthquake. Additionally, the very long wavelength of tsunami prevents it from acting like a normal deep-water wave- instead they behave as if they are in shallow water, and are therefore called shallow water waves. In order for a wave to be considered a 'shallow water wave' they must be traveling in water less than 1/20 of the wavelength. No problem if your wavelength is nearly 250 miles; the deepest point in the ocean is less than 7 miles; a tsunami would need a depth of 12.5 miles to be considered deep water. So how do you know how long it will take a tsunami will take to reach land? That is completely dependent on the depth of the water it is in; the shallower the depth, the slower the wave moves. So at a depth of 200 meters, a tsunami would travel at about 45 m/s, or more than 100 miles per hour! Knowing how far out to sea a fault line is can help experts estimate evacuation times before a tsunami hits land. Now that we know a little about how tsunamis function inland, what about out at sea? Assuming the ocean floor is at 4,000 meters, a tsunami wave would be traveling at a breakneck 197.6 meters per second; or 442 miles per hour! But what else is unique about tsunami waves is that they have a very small wave height in deep water, passing by quite un-noticably. However, when a wave approaches shore and begins to 'feel' the bottom, it slows down- and that energy has to go somewhere. As a result, wave height builds very quickly when the wave approaches the continental shelf. What was a wave of only a few meters quickly rises to tens of meters. So here is the million dollar question: how far out to sea would you want to be if a tsunami hit? The answer is: it depends on where the continental shelf is. Because the ocean floor rises quickly at the continental slope and shelf, wave height builds just as quickly. To survive a tsunami at sea, you would want to be past the continental shelf. For a place such as Oregon, this means you should be at a depth of 50 fathoms (a fathom is 6 feet) or 300 feet. This means you will be will past the continental shelf. Depending where you are, this could be anywhere from 14 to 20 miles (12-17 nm) from shore. So really, if you are already a ways out to sea, this might really be your best (and safest) bet. However, if you are close inshore, get to land quickly and above the tsunami zone. You may have as little as a few minutes to get to safety! To learn more about different types of waves, visit East Carolina University's great geology page on the matter.